Palm Beach, FL — In what could be one of the most effective solutions for excessive force by police, federal marshals seized the personal possessions — from the sofa and lamps to clothing and an iron — of a South Florida deputy who shot a man holding a cell phone, paralyzing him. 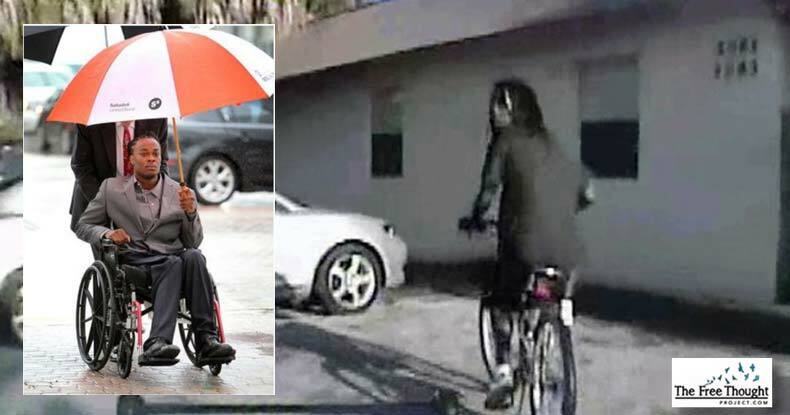 Palm Beach County Sheriff’s Deputy Adams Lin spotted 19-year-old Dontrell Stephens in a “high-crime area” — the man’s own low-income neighborhood — on September 13, 2013, riding a bicycle in a manner the deputy found suspicious. Lin stopped the youth, who dismounted the bike with a cell phone in his hand and slowly approached the officer. Just outside the range of dash cam video, the officer shot Stephens four times — claiming he was in fear for his life — but footage and evidence clearly showed the claim to be baseless. Three of the bullets remain lodged in Stephens’ body, according to the Sun Sentinel — two in his arm and one in his spine, which left him paralyzed and dependent on a wheelchair for mobility. In a lawsuit against Lin and the sheriff’s office, a jury awarded Stephens over $23.1 million — an amount later slightly lowered to $22.4 million — which, as standard practice, would come straight from the pockets of taxpayers. Since Florida law places a $200,000 limit on payouts like that awarded to Lin’s victim, the case must go before Florida state legislature — but that may never happen. While the settlement languishes, Stephens’ attorneys demanded Palm Beach County Sheriff Ric Bradshaw to make good on the $200,000 — but he balked and filed an appeal. But the judge also understood Lin couldn’t be stripped of all income, considering he has a daughter and family responsibilities. “In November,” the Sentinel explains, “U.S. Magistrate Judge Barry Seltzer ruled that none of Lin’s $82,400 in wages should be garnished to help pay off the judgment because he proved he was ‘head of a family’ since he provides more than half of the support for his 6-year-old daughter. It seemed Stephens would not receive justice for being unjustly shot and bound to a wheelchair — but the deputy’s personal possessions aren’t exempt in the matter. So when Sheriff Bradshaw refused to pay, Seltzer gave the green light for federal marshals to seize everything of value from the deputy to be sold at auction to help pay the man’s medical and living expenses. “Lin read the court order, became visibly shaken, and fainted, collapsing to the ground, Scarola said. “Among the items taken: his car, couch, coffee tables, end tables, lamps, his collection of Samurai swords, flatscreen TV, iron, ironing board, computer, golf clubs, bicycle, tools, and almost all of his non-Sheriff’s Office clothing, Scarola said,” according to the Sentinel. “I don’t think we took any shoes and I don’t think we took any underwear,” Scarola told the outlet, but “shirts and pants and shorts are all gone, jackets. Scarola lamented that Lin’s possessions had to be seized — an action he said he warned the sheriff would happen if the $200,000 weren’t paid — but the horrific aftermath of the deputy’s unjustified use of force must be addressed. Unfortunately for Stephens, marshals, movers, towing fees, and other expenses from the seizure will have to be paid before he receives a cent — but the young man will eventually receive funds to assist with his expenses. Perhaps, if law enforcement officers feared losing literally everything but the clothes on their backs, the decision to shoot — rather than de-escalate or employ a less-lethal weapon — might not come so quickly.